American Girls in Moscow: Maria's Children in Colorado! Come meet Patch Adams, the famous physician who realized that laughter is sometimes the medicine patients need most—and founder of the Gesundheit! 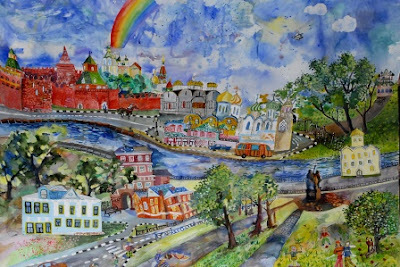 Institute, and Maria Yeliseyeva, the founder of Maria's Children, the wonderful organization based in Moscow that for 15 years has been helping orphans and children with special needs through art therapy. The evening will be an art exhibition and live auction featuring works created by students from Maria's Children Art Center in Moscow. Saturday, May 12th at 6 p.m. Admission is $50, and children under 12 are free. All proceeds go to the Maria's Children Art Center. Please RSVP by May 8th to Maria Stepanyan: mariastepanyan@gmail.com, 303-588-7094. Please spread the word! I've been to the Patch Adams/Maria's Children auctions in Moscow for the past six years and the evening is unforgettable. You will be amazed by the masterpieces created by these children, so full of thankfulness and hope and featuring fantastical fairy-tale and Russian motifs. Urge your MIL to go for the evening. Wish they came closer to our area. Have you thought of contacting Father John to let people at his church know about it? Is it possible to buy copies of the artwork? Used to live near Boulder but not now so can't attend. 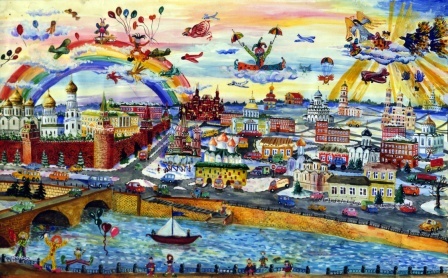 But I love the whimsy, colors, and Russian themes of this art! What talented kids! Some weeks ago - on 08.5.2012 – I posted a comment and I would very much appreciate a quick status update. And can you please not post this comment and delete the previous comment posted by me as it was only a form of contact.